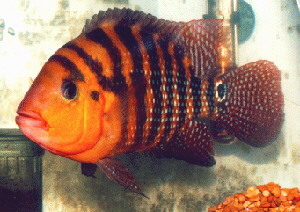 (My Experiences in Breeding and Keeping Cichlasoma festae) Ok lets just start at the beginning, the first time i saw a Cichlasoma festae was on CHOP a Cichlid Page on the internet one of the basics but still very good. I fell in love instantly, the colour was amazing i really couldn't believe it, The picture from CHOP, a very Orange male Festae i thought " this has to be touched up". So i set out on a heavy search, trying to find every Festae picture possible, i found a few but not nearly as many as i hoped. The best page was found to be Real Cichlids Don't Eat Quiche it had many pictures of many very cool fish, but that is another story. 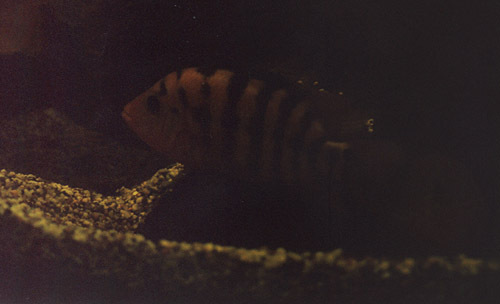 These are some of the pictures from Real Cichlids Dont Eat Quiche. These are both female Festaes. I found it finally a page with more Red Terror pictures, i inspected them thinking here we go there going to be some gray fish with a slight red tinge. I was pleasantly surprised, the pictures i saw were equally as impressive as the photo found at CHOP. That's it i decided i had to have one, but i didn't get my hopes as here in Australia there are many fish we cant get or import. 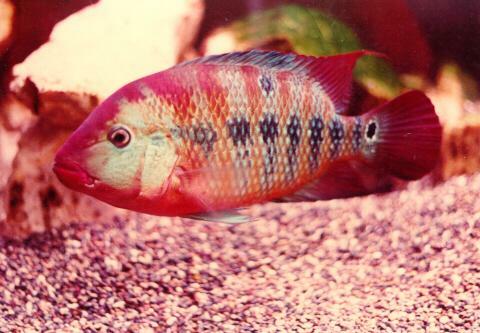 I posted a message on an Australian Cichlid discussion board and got a very quick reply, the owner of the discussion board David Midgley was an avid American Cichlid fan and was great help, a Fish Shop he worked in had some 1" Festae's for $13.95 AUD each . I couldn't believe it i found an awesome fish, you could get it in Australia but the price was huge. Well at the time it was i had actually never brought Tropical fish before but had just bought a second hand tank and had a $50 a week paper job ( i was in year 11 at school at the time) , so i had no idea how much fish normally cost, compared to fish i have now this is extremely cheap. I had read in a number of places that with Americans if you wanted a breeding pair you should buy at least 6 juveniles and grow them up together, this was going to cost me around $84 not money i really had. So anyway i put of the Festae's for a while waiting to save some money, and saving i'm not the best at. So it was probably about 1 month after the festae urge i had and Dave sent me a message saying he had a 3" Festae a friend of his had and sold it to him for $5 and it was mine if i wanted it so i said definitely and i asked him to pick up another 1" from his work and have my fingers crossed for a Male and Female. As soon as i had a free day i arranged to pick the fish up from Dave along with some fish Dave was giving away and i'm not one to say no. The first time i took a peak at the Festae i thought damn all the pictures of Festae on the net must be touched up, this 3" fish was a drab gray color with a small amount of red tinge on his cudal fin. But i took him home and watched him grow hoping there would be a colour change soon, the smaller one i got from Dave's shop and it was the same in appearance. Anyway the big festae went from 3" to 4" then to 5" the colour seemed to be a little stronger but not by much, the gray however had turned a pale yellow green colour, all during this time the smaller Festae had not grown at all from what i could see. I was told they were slow growers, but my large male was doing ok, why hadn't this smaller one grown. I just put it down to fry growing slow and speeding up when they get around 3". I also got a second 1 " festae from Dave's work again still the same drab colour, i also had this fish with the other 1" fish for about 2 -3 month and still no growth. I started to notice that the smaller festae had hollow bellies, i was told this was from not eating, about 1 month later both died i presume from starvation i fed them heaps but they didn't want to eat. I accepted these deaths telling my self they just must be hard juveniles to raise, this was enforced by the fact i never ever saw large specimens of Festae in shops. After the deaths of the 2 1" Festae's i decided not to get anymore but would keep looking for a larger festae as i new raising them from 3" was easy as my larger Festae was now 6" he grew steadily till about 8" in size roughly 1 year after i got him from Dave this was when i started really looking for a female. I started to find many larger males but never ever females by this time i had also met another American Cichlid enthusiast, Kevin Sorrensen. Kevin proved to be extreamely helpful, about 1 month after i met Kevin he had an 8" female for me. I was stoked i wanted to pick her up straight away but Kevin lived about 2 hours drive from where i did, anyway a week later my Mum was going to visit a family friend who lived about 1 hours drive further than Kevin. So it was organized i would drop by Kevin's and take a look at her, Kevin was concerned that she would still be to stressed for the long trip back to my house, but as usual i was impatient to get her home. 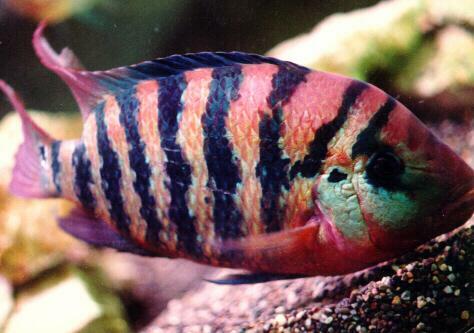 I had agreed with Kevin to drop by take a look and see if i wanted to take her home, we arrived at Kevin's at around 6 pm i was so excited i had never seen a female Festae before and i had since found out that unlike the other American Cichlids the females had the most colour. She was beautiful even thought she was like Kevin said very stressed and due to the stress had an amazing blue colouration. I couldn't believe it here was a supposedly very red fish that was blue, however you could see a dark maroon colour under the blue sheen which led me to believe the blue was because she was stressed, and she was truly a Red Terror. So anyway i started talking to kevin about taking her home i knew i should probably pick her up at a later date when she was less stressed but i also knew the chances of me being down this way again anytime soon was slim, so i decided i would risk it and take her. Then there was the dilemma that we were on our way to see a family friend and that was a further hour away then a 2 hour stop then the return 3 hour trip home, and i didn't want her to travel 6 hours in a esky. So we decided to drop by Kevin's again on our way home. So again at 10.30 pm we dropped by Kevin's picked her up and left, finally i had a female Festae. Finally we were home and the female Festae was doing fine, Kevin had given strict orders not to put her in with the Male till she had recovered from the trip and stress so i put a divider in the tank and introduced her to the tank, by this time it was about 1 am so i promptly went to bed. I woke up the next morning and bolted downstairs to see how she was doing, i turned the light on and she was still hiding in the same place she went last night but still alive. Like i said i don't have much patience and i really wanted to see how the male would react to her. So i removed the divider, the Male eagerly went to investigate and as soon as She noticed the Male she instantly turned from blue to a bright red, i guess all she needed was a male interest to make her forget about her stress. The mouth locking begun instantly and the female was noticeably winning, the male gave up after only a short period of time and the female proceeded to strut her stuff, with a huge gill flare and fins extended to there full capacity, and some groovy shaking, the male started up doing a similar thing. I took this as good news and left them for about an hour, i came back and the male was hiding under a log and the female was swimming proudly round, this amazed me but i quickly put the divider back in as i had to go to work and didn't want to risk the male leaving them out without my supervision. When i got home from work again i let them out and again the same thing happened, after this i figured the tank may be a little small, it was 4ftx18"x18" tank with the Festae's the only occupants, i had a larger 5ftx24"x30" so i promptly started rearranging fish until i had a spare 125 gallon tank, the Festae's were put in together and there were no problems whatsoever. About 2 weeks after they were put in the big tank i noticed the females tube was dropping and by the end of the next week and after a extreamely aggressive spawning ritual (both male and female had marks on there face from lip locking and shredded fins) i had a somewhat dodgy patch of eggs, there were spread everywhere but no where near as many as i imagined, i thought she may be eating them so i moved the eggs to a tank of there own, the fry hatched but not 1 survived, there was only about 10 fry that made it, i figure better luck next time. I was sitting down next to the tank just looking at my prized pair as i do and i noticed a little long brown sucker fish that i had missed when i was rearranging fish for the Festae, that's when it hit me the sucker fish had eaten the eggs, it then took me about 3 hours to catch the little bugger but it was eventually removed to another tank. At this point in time i also had a pair of 8" Dovii that had already bred and were growing to big for there 70 gal so they were moved into with the festae pair. The next day i awoke to a female Dovii floating at the top of the tank she was still breathing so i moved her and she died a day later the male Dovii was also damaged but not as much as the female was i also moved him and he is still healthy to this very day. I put this attack down to what your about to here happened next. About 1 month later i had another batch of eggs, this time a huge full patch was there, so as always when my fish breed it was the longest 13 days of my life (this is actually an unusually long period for most American Cichlids) until the larvae had hatched and became free swimming. I had decided before hand during the long 13 days that i would remove half of the fry for me to raise and leave the other half for the parents to look after, so i siphoned out about half the fry and put them in a fry raising tank. About 1 week later half the fry i had removed just died, and so did half the fry in the tank with the parents, i still don't understand as to why this happened, i have a theory about the food i fed them being to big for them but that will have to wait till another time. I was'nt to upset about this as i still had a huge number of fry left, but the number of fry continued to drop slowly in both the big tank and fry tank until i thought i had about 100 fry left in my fry raising tank and about 50 in the tank with the parents and this stage the fry stopped dying off.